Note: If you are using QuickBooks Online as your accounting software, please check our article QuickBooks Online Sync Preferences. 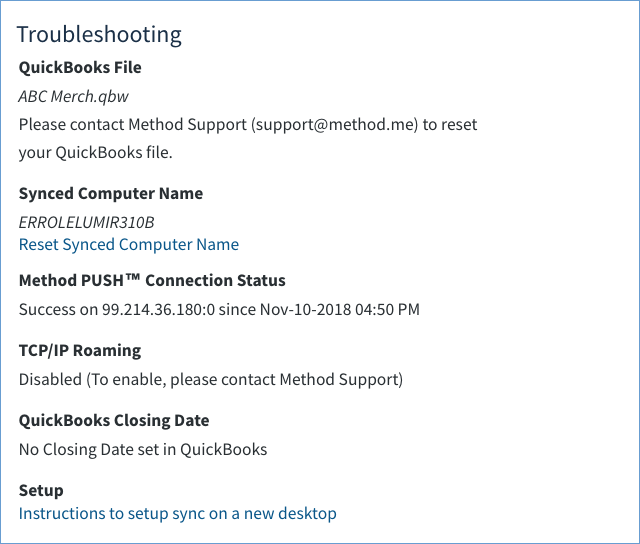 Full Sync: The last time Method performed a full sync (all records shared with QuickBooks are updated). See below for View Details. To manually initiate a full sync, click Perform Full Sync link. For more information on everything entailed in a full sync, please see our article Method Sync in Detail. 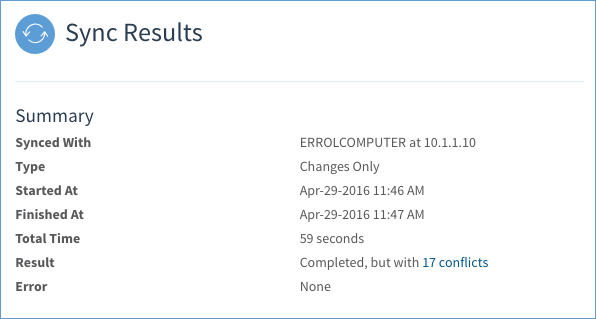 Changes Only Sync: The last time Method performed a changes-only sync (only records that have been changed since the last sync are updated). See below for View Details. To manually initiate, click Changes Only Sync link. 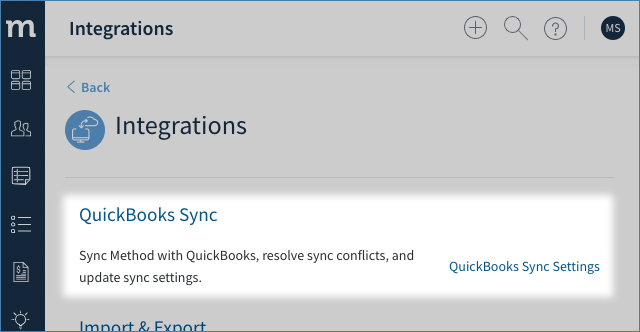 Sync conflicts: A sync conflict happens when QuickBooks is unable to complete or rejects a request by Method to add, modify or delete a record. Click View Conflict to be brought to the Sync Conflicts screen. See QB Desktop Sync Conflicts for details. The View Details screen for full and changes-only syncs provide additional information in real time about the last completed sync. Let Method assign Transaction numbers: QuickBooks transactions have a ref number field (transaction number) which is a user defined ID for the transaction (e.g. "Look at invoice number 28"). This number is automatically and sequentially assigned by QuickBooks when the transaction is saved. Enabling this option allows Method to take over the assignment of transaction numbers instead of waiting for QuickBooks to do it. - When checked, the transaction number will start +1 after the last transaction number in Method, whether the transaction was archived or not. - When unchecked, the transaction number will start +1 after the last transaction number in QuickBooks. 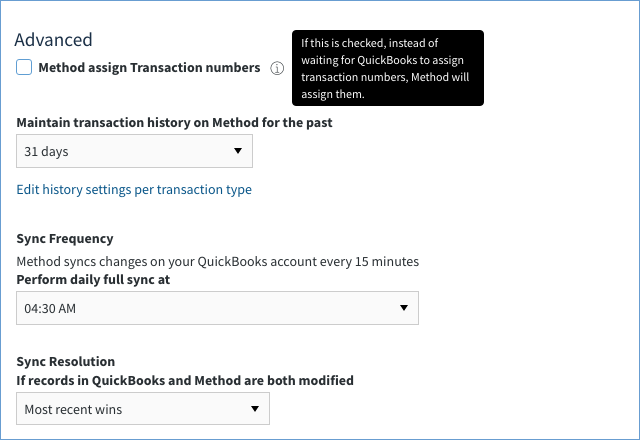 NOTE: When using this feature we strongly suggest creating transactions in Method or QuickBooks but not both. Doing so may result in transactions with the same number. Maintain Transaction History: How far back Method keeps your transactions (estimates, invoices, sales orders, etc.) when performing a Full Sync. Transactions beyond this time frame will not be synced but remain in your QuickBooks file. For more information, please see our article Method Sync in Detail. NOTE: Invoices with a balance greater than zero and sales orders that are not fully invoiced ignore this rule until they are paid off in full. Sync Frequency: Method performs a changes-only sync every 15 minutes while the PUSH Connection is active. Perform daily full sync at: Method will attempt to perform a full sync at the specified time. If unavailable, we will re-attempt each day at the same time. We suggest a time of day you're not likely to be using Method, since a full sync is extensive and can take time. 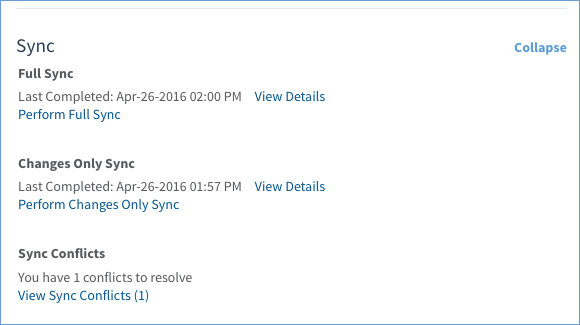 Sync Resolution: If the same record(s) is modified in both QuickBooks and Method while the sync engine is not available, there may be an editing conflict. This setting tells how to resolve the conflict. The sync engine is offline from 10:00am to noon. Bob Crenshaw’s profile is updated with a new phone number in QuickBooks at 10:30. It's updated with a new address in Method at 11:15. When the engine reconnects, Method performs a changes-only sync and discovers the record has been changed and this becomes a conflict. - Most Recent Wins: Most recent change will take precedence. In our example, new address is updated, phone number is unchanged. - Method Wins: Method update takes precedence. In our example, new address is updated, phone number is unchanged. - QuickBooks Wins: QuickBooks update takes precedence. In our example, Phone number is updated, address is unchanged. - Enter into "Resolve Conflicts": Neither phone number nor address gets updated. In this case, Method opens the Resolve Conflicts list and lets you manually choose from the above choices. Synced Computer Name: The main computer that hosts the QuickBooks company file above. Usually the same machine the initial sync was completed on. Reset Synced Computer Name: If you change the computer hosting your company file, Method will no longer recognize it. If you make this change, click Reset and then re-sync. Method PUSH Connection Status: Sync engine status (connected or disconnected) and duration of status. TCP/IP Roaming: Reserved for Method users on Right Networks. By default, this option is disabled. Please contact Method Support for more information on this option. QuickBooks Closing Date - The closing date set in QuickBooks. Instructions to setup sync on a new desktop: This opens the first steps to set up a sync on a new desktop, as you learned about here.